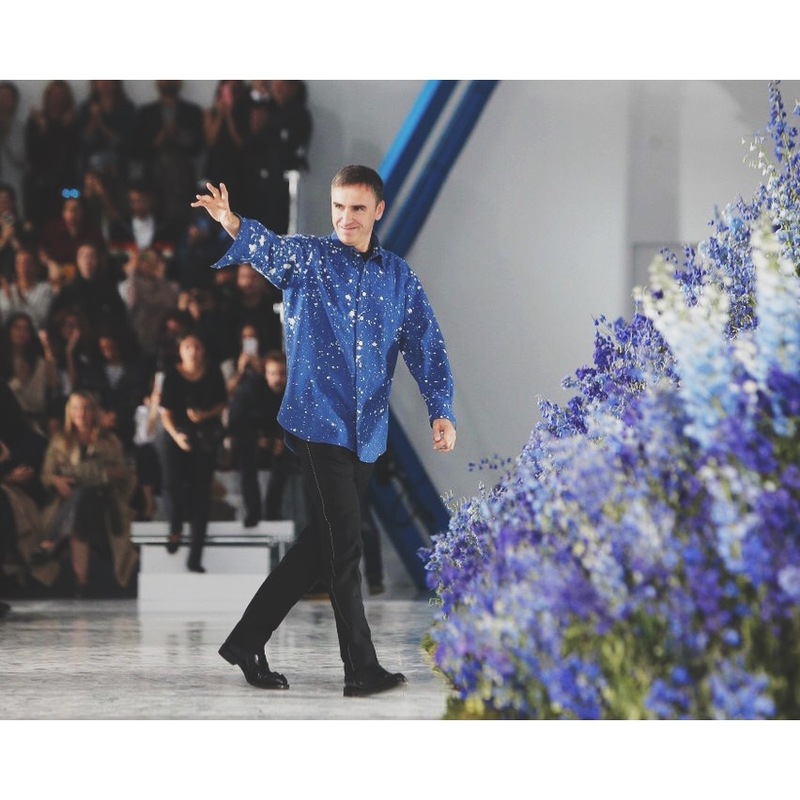 Raf Simons is leaving his role as artistic director of women’s haute couture, ready-to-wear and accessory collections at Dior, the French luxury fashion house announced today. According to Dior, Simons “reached this decision for personal reasons.” The designer’s Spring/Summer 2016 collection, presented in Paris last month, was his last for Dior and marks the end of his three-and-a-half year tenure at the house. Simons’ successor has yet to be identified, but the search for a replacement has begun, according to market sources. Those interests include Simons’ eponymous fashion house, which is expected to continue showing its collections in Paris. Simons, 47, made the decision to leave Dior after he and the company failed to reach an agreement on a new employment contract, though the parting was amicable, according to sources. 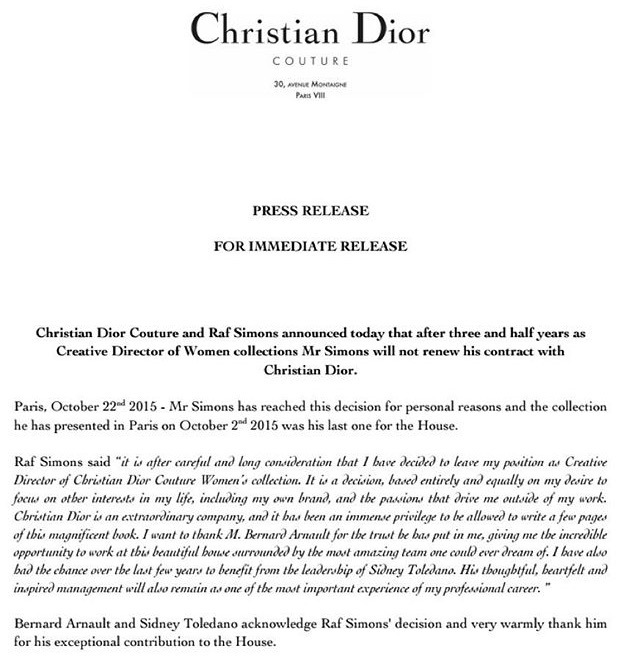 Bernard Arnault, chairman and chief executive officer of LVMH Moët Hennessy Louis Vuitton and Christian Dior SA, and Sidney Toledano, chief executive officer of Christian Dior Couture, “very warmly thank him for his exceptional contribution to the house,” read the statement. Neither the designer or executives at the brand made comment beyond the one-page statement, released after close of trading on the Paris stock exchange. Simons, who joined Dior in 2012 after a seven-year stint at minimalist fashion label Jil Sander, brought an intellectual, art-infused vision to the house, drawing on his menswear roots to create modernist designs that are said to have resonated with customers. Toledano recently told French newspaper Les Echos that Dior Couture had seen a 60 percent growth in revenues since 2011. The departure is sure to kick-start fierce speculation about who will be next in line to take on one of the most prestigious creative roles in the fashion industry. As for Simons, his next move remains unknown, though the designer may be restrained by a non-compete clause, typical in this kind of role, that would temporarily prevent him from working for rival companies. Revenues at Christian Dior Couture rose 12.9 percent in its fiscal first quarter (the three months ending September 30th) reaching €471 million (about $553 million). Excluding the impact of currency, the rate of growth was 5 percent. This entry was posted in Latest News and tagged bof, dior, Raf Simons, SS16. Bookmark the permalink.